How could anyone believe that Iain Duncan Smith is now serious about combating food poverty? In December 2014 a shocking Church of England funded report into the exponential growth in food bank dependency was published. In this article I'm going to consider the report and its findings, look at the ludicrous initial responses from the Tory party and then examine Iain Duncan Smith's claims that he will offer a "positive response" to the findings. As is often the case, the vast majority of the mainstream media coverage has failed to include an actual link to the report so that people can read it for themselves. I think it's important that people do have the option of viewing the documents for themselves, so here's a link. The Feeding Britain report was financially backed by the Church of England and the inquiry members were Tim Thornton (the Bishop of Truro) Frank Field MP (Labour) John Glen MP (Tory), Sarah Newton MP (Tory) Emma Lewell-Buck (Labour) and the unelected peer Anne Jenkin (Tory). The report concluded that a number of factors have contributed to the dramatic rise in food bank dependency. One of the main factors is the skyrocketing cost of living, with food prices prices up 46.4% since 2003 and fuel up 154%. These rises compare very badly with the average increase in wages (up just 27.9%). Another important factor is the increased use of benefits sanctions designed to condemn people to absolute poverty for "crimes" such as being five minutes late for an appointment, having a heart attack during a employment assessment, selling poppies for a few hours a week for the Royal British Legion, attending a job interview, or refusing to work for no wages at giant multinational corporations like Poundland (owned by the US Private Equity group Warburg Pincus). The report itself details cases of people having their benefits cut off entirely for writing information on the wrong line of a document, attending an urgent medical appointment with their daughter and not applying for jobs after the deadline had already passed. Some of the recommendations in the report include better redistribution of food wasted by supermarkets so that it can be used to feed the poor, the establishment of an Office For Living Standards within the Treasury, an increase in the minimum wage, reform of the benefits sanction system including the introduction of "yellow cards", reductions in benefits delays and many other things. I suggest that you follow the link to the report and scroll down to page 46 if you want to read the summary of all of their recommendations. At first the Tories attempted to spin their way out of admitting there was even a problem. The unelected Tory peer John Nash tried to deflect criticism by saying that food bank usage "went up 10 times under the previous government" a look at the actual figures shows how misleading this particular statistical soundbyte is. Food Bank usage increased from 2,814 in 2005-06 to 40,898 in 2009-10, an overall increase of 38,000 people per year using food banks. Under the Tory led government it has soared to 913,138 people per year - an increase of 872,240 people. Only in the world of tribablistic political excuses does an increase of 40,000 counterbalance an increase of 870,000. Then the unelected Tory peer Anne Jenkin waded in trying to distract attention away from the findings of the report with a ludicrous assertion that poor people use food banks "because they don't know how to cook". If this were really the reason for the exponential growth in food bank dependency it would mean that hundreds of thousands of people must have simply forgotten how to cook since 2010! Anne Jenkin was quick to retract her remarks after the storm of criticism they provoked, but the fact that such a person was on the Inquiry panel arguing the Tory case that poor people are to blame for their own poverty, just goes to show that had the inquiry team not been packed out with Tories, the conclusions and recommendations would surely have been even more hard-hitting. Iain Duncan Smith has a long track record of obfuscating, misleading and outright lying when it comes to issues such as benefits sanctions, absolute destitution, workfare, the appalling treatment of disabled people and food bank usage, however this report poses a serious problem for him. Not only is it backed by the Church of England (Iain Duncan Smith laughably claims to be motivated by Christian ethics! ), more than half of the politicians on the inquiry were Tories.This means that he can't just dismiss the report as being politically partisan in the way that he's casually dismissed other hard-hitting food poverty reports (such as the work of the Trussell Trust). In a particularly weasely and misleading statement Iain Duncan Smith promised to respond positively to the report, but anyone who is familiar with Iain Duncan Smith's track record (making up qualifications on his CV, bragging that he could live on £53 per week for a year then not following through, obfuscating and obstructing, showing contempt for the dead, misusing official statistics, unlawfully bypassing parliament, lying about court judgments against him, willfully ignoring court judgments against him etc) must know that he's not a man to be taken at his word. We only have to look back to December 2013 to see the real attitude of Iain Duncan Smith and the Tories. After laughing, shouting and smirking their way through a debate on food poverty the Tories and their sickening Lib-Dem enablers defeated an opposition motion to compel the government to begin combating food poverty (by 294 votes to 251). Iain Duncan Smith showed his outright contempt for the whole issue by refusing to speak on behalf of the government (instead passing the buck to his odious sidekick Esther McVey) and then walking out of the debate after less than an hour. Within a week he launched a blistering tirade at the Trussell Trust, which gave a very clear forewarning that the Tory Gagging law was actually designed to silence political criticism, not to regulate the lobbying industry as they tried to pretend. Does anyone really believe that a man with a long track record of dishonesty; a man who who instructed his Tory colleagues to vote down a motion to compel the government combat food poverty just one year ago; a man who couldn't even be arsed to speak in, or even sit through the debate, is a man who has suddenly had an epiphany and decided to make combating food poverty one of his main priorities? Is anyone really that gullible? A look at some of Iain Duncan Smith's other comments about the Feeding Britain report illustrate the fact that he's sticking to the same tactic of snide, sneering dishonesty. One of the strongest indicators that he's simply going to continue as before was his statement that "It’s really ridiculous to assume that every single reason why someone is going to a food bank is down to what the DWP does". This is a blatant straw-man argument because the report doesn't say this, in fact nobody says this. Most people are well aware that the Tory "war on wages" has resulted in the longest sustained decline in the average wage since records began, and that as a consequence, huge numbers of working families have been driven into dire poverty and food bank dependency, which means that DWP decisions are clearly not the root cause of every single instance of food bank dependency. What this straw-man argument shows is that Iain Duncan Smith is still insistent on using fallacious debating tactics to make his own incredibly weak debating position look stronger. We shouldn't be shocked that a man with such an appalling track record of dishonesty would use the tactic of making up a rubbish argument and then demolishing it in order to make his own desperate position look better. What we should be shocked by is the fact that, as always, the mainstream media are totally unwilling to hold him to account for using these appallingly sly debating tactics. Another indicator that Iain Duncan Smith is going to continue his shockingly dishonest approach is his attempt to paint the exponential growth in the use of benefits sanctions as some kind of accidental occurrence where vulnerable people are slipping through the cracks, rather than them being deliberately forced into the meat grinder by a department driven by Iain Duncan Smith's desire to juke the unemployment statistics by tricking as many vulnerable people as possible into losing their benefits and by forcing them onto Stalinist style unpaid labour schemes under the threat of absolute destitution. Rigging the headline rate of unemployment is one of Iain Duncan Smith's main objectives as head of the DWP. The way this is achieved is by forcing unemployed people onto unpaid compulsory labour schemes like "Help to Work". Even though the hundreds of thousands of people forced on these schemes have no wages, and they're still claiming unemployment benefits, they are not included in the official unemployment statistics. If people refuse to go on the schemes, they are stripped of their unemployment benefits, meaning that they too are not classed as unemployed on the official statistics (unless they carry on signing on in order to receive no money). Thus under Iain Duncan Smith's system people are given the choice of doing forced labour and disappearing off the unemployment stats, or refusing to be exploited as a source of free labour for Iain Duncan Smith's mates and disappearing off the unemployment stats. Another way in which Iain Duncan Smith's department have tried to artificially reduce the headline unemployment rate is through sanctions league tables. Before 2013 Iain Duncan Smith, other members of the Tory party and numerous DWP spokespeople all repeatedly lied that there were no such things as sanctions league tables, until the sanctions league tables (that supposedly didn't exist) were leaked to the press in March 2013. The problem with sanctions league tables and the setting of sanctions targets is that it is much easier for Jobcentre staff to meet their targets by tricking the mentally ill and the severely uneducated into committing sanctionable offences, than it is to invest a great deal of time trying to catch out the tiny minority of hardened benefits claimants who are very clued up at gaming the system. Thus hundreds of thousands of vulnerable people have been thrown into absolute destitution to meet the sanctions targets that Iain Duncan Smith and the Tories repeatedly lied about the non-existence of. Sanctions league tables and targets do exist, a culture of tricking people into committing sanctionable offences has been encouraged within the DWP and hundreds of thousands of people have been faced with the "unpaid labour or destitution via sanctions" dilemma. These are some of the big reasons behind the exponential growth in people getting sanctioned, and significant causal factors in the rise in food poverty, but instead of admitting culpability in these deliberate policy of impoverishment, Iain Duncan Smith is insistent that it's all some kind of unforeseen tragedy, and now that he's aware of it "we want to do everything we can to make sure that people do not stumble into a process of sanctions". When the Trussell trust used the information in the "reason for referral" box on their referral forms to begin collecting proof that benefits sanctions and benefits delays were responsible for a significant percentage of food bank referrals, Iain Duncan Smith refused to countenance reforming the system so as to prevent people falling into abject poverty (because the fear of abject poverty is one of the main tools he uses to get people to participate in his forced labour schemes). What the DWP did instead was to ensure that the "reason for referral" box was simply removed from the food bank referral form so that the Trussell Trust no longer had easy access to the data proving DWP culpability. When Iain Duncan Smith says that he's going to "do something positive", we should be very wary indeed that his idea of doing something positive is not some kind of euphemism for attempting to destroy or cover up the sources of the information that people are using to criticise him with. In my view Iain Duncan Smith is the most dishonest and vindictive cabinet member in the most dishonest and vindictive government in living memory. He's proven his dishonesty and his malice towards those he considers to be beneath him on countless occasions. 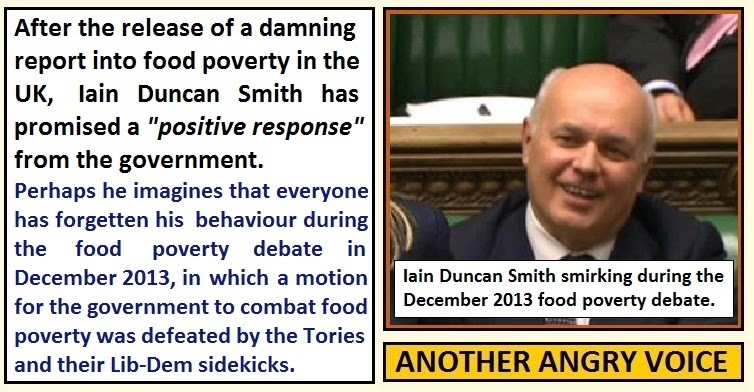 Anyone who is inclined to believe his claims that he's going to take "positive action" to combat the exponential growth in food povery only needs to look at his shocking behaviour (and the outrageous behaviour of his party) when the subject of food poverty was debated in parliament less than a year ago. This is a man who couldn't even be bothered to sit through the food poverty debate (as well as having lied about the non-existence of sanctions league tables, lied about court judgments against him and blatantly misused official statistics). If anyone thinks that this is a straight-talking guy who will stick to his word, they must be the most dismally poor judges of character. It is incontestable that thanks to his draconian regimes of "workfare or sanctions" and the widespread use of sanctions targets and league tables within the DWP, Iain Duncan Smith is largely responsible for the shocking rise in food poverty. Therefore you'd have to be completely out of your mind to think that he's an appropriate person to be given responsibility for reversing it. 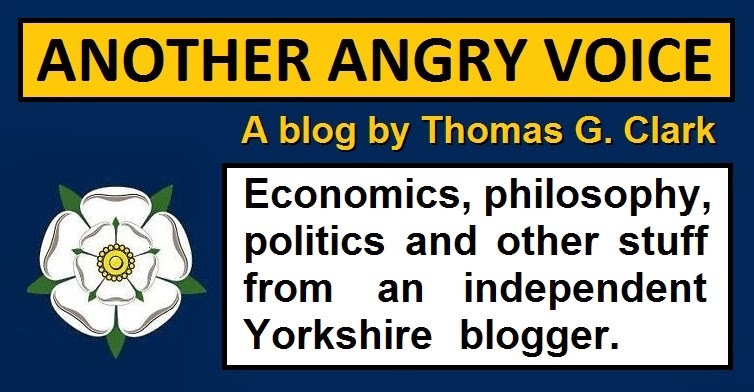 Another Angry Voice is a not-for-profit page which generates absolutely no revenue from advertising and accepts no money from corporate or political interests. The only sources of income for Another Angry Voice are small donations from people who see some value in my work. it would be massively appreciated. Does the WCA regime for disabled people constitute psychological torture?